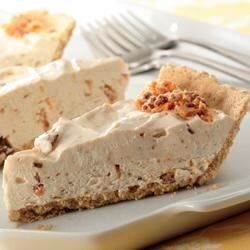 "Peanut-Butterfinger Cream Pie is the perfect make-ahead dessert for a summer party." Beat cream cheese, peanut butter and powdered sugar in large mixer bowl until smooth. Stir in about 1 cup whipped topping until well mixed. Fold in remaining whipped topping. Chop 3 Butterfinger bars and fold into mixture until well distributed. Spoon into crust. Freeze for 3 to 4 hours or until firm. Before serving, chop remaining Butterfinger bar and sprinkle around perimeter of pie. Did this for Thanksgiving and it was gone as soon as I got it out. Everyone loved it. Very easy to make. Turned out smooth and creamy! Next time I think I will use my own graham cracker crust, but other then that great recipe. Great!-wouldnt change a thing!I'm asked to bring this pie every Chrismas! Very easy go to desert. I made this for Thanksgiving and it was a huge hit! Thank you! I made this for a family BBQ and it was a hit! Will be making this again. Made it this weekend and everyone loved it! I used 5 Reese cups with Reese pieces for the batter and topped with Reese miniatures. I will try with the butter finger next time.